It’s that time again, time to sit down with one impossibly talented illustrator before breakfast. Rather, over breakfast. Tricia Tusa’s here, joining 7-Imp for a cyber-feast. And what is Tricia’s breakfast of choice? “Two eggs over easy, three pieces of bacon, two pancakes, hot Red Mate tea with milk and honey, a handful of vitamins. If there is time, I will juice kale, parsley, carrots, cucumber, beets, apple and lemon together. I feel more secure starting my day with a large amount in my belly.” That, my friends, is a real breakfast. 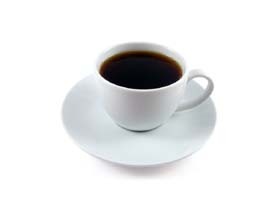 As long as I can add my coffee, I’m more than happy with that meal. And especially the company. 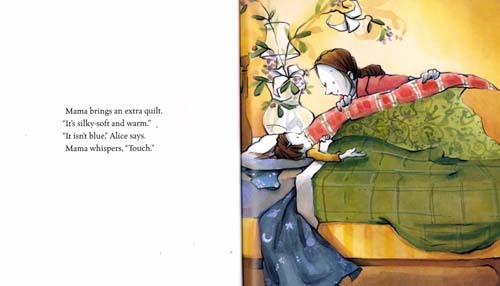 Tricia’s been wow’ing me lately with her illustrations, and in 7-Imp’s world, I’ve recently run my mouth about In a Blue Room, written by Jim Averbeck (Jim is interviewed here), published this year by Harcourt, and last year’s Fred Stays With Me!, written by Nancy Coffelt and published by Little, Brown Young Readers. But here’s the thing. As you will see below, Tricia has illustrated about FIFTY books. (Note her response to the can-you-list-your-books-to-date question: She’s illustrated so many that even she’s not sure how many total she’s graced with her paintbrush.) And I can’t find a Tricia Tusa bibliography online anywhere. It PAINS me to not include a comprehensive list of her books to-date, but . . . well, you read the same thing I did: There are FIFTY, folks. Not to mention, I’m sure you, our devoted readers, know how to do title searches. So, I’ll leave that rewarding search up to you. That said, I feel rather like a poseur gushing about her illustrations when I’ve seen exactly two of her books. Ahem. Shameful, I know. But, hey, a girl’s gotta start somewhere. I really like what I have seen, not to mention you can bet I’m off to do a library search for her previous titles. I predict that one day really soon I’ll be walking in the door with a hugely huge stack of Tusa-illustrated titles to explore. That’s my plan anyway. While we’re setting the table for our breakfast chat, let’s get the basics from Tricia. But first I want to thank her for stopping by. And how much do I love that she shares her quirky brainstorming techniques (see her various ways of cocooning below)? A whole, whole lot. What a fun interview this was, and many thanks to her. 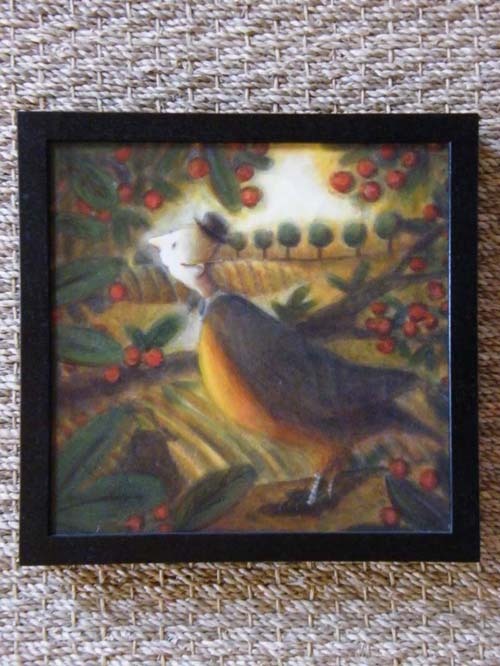 Tricia: I am an author/illustrator. I wrote and illustrated about ten books in my twenties, into my thirties…and then had my daughter at age thirty-five. Somehow, I found writing more difficult after her arrival — less time to fully immerse myself in that solitary process. So, since then, I have mainly been illustrating others’ words and really enjoying it. Ideas for books keep popping up, though, in my head, beckoning me to complete them. Tricia: I have illustrated about fifty books? Tricia: I live in a house on a hilltop in a village of about three hundred people in northern New Mexico. 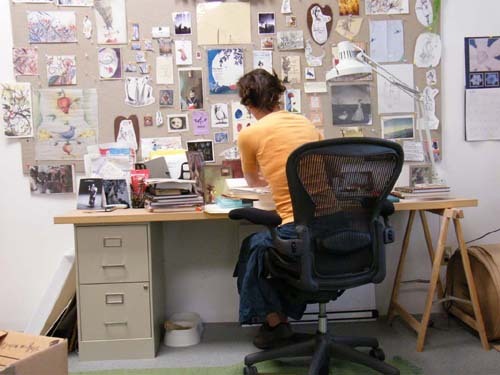 Tricia: At age five, I announced (to the walls) that I would make books for children as an adult. (I also wanted to be a child psychologist as well as run an orphanage!) Right out of college, I moved to New York City and put together a very home-made portfolio of art work. I called several publishers listed in the Yellow Pages and made appointments with Art Directors. Quite a few were very encouraging and suggested I write as well — putting words to the pictures I was showing them. Holiday House took a chance with me and had me illustrate two books for them. I, then, did several books with Macmillan that I both wrote and illustrated. This began at age twenty-one and has continued to this day, twenty-six years later. 7-Imp: If you do school visits, can you tell us what they’re like? Tricia: I have a Master’s in Art Therapy and really enjoy mixing up my illustration work with this more interactive work. The most recent place was M.D. Anderson Cancer Hospital in Houston. I worked with the teenagers. Tricia: At the moment, I am illustrating a chapter book called The Problem with the Puddles by Kate Feiffer. Simultaneously, I am working on a picturebook by Sarah Sullivan called The Amazing Adventures of Lizzie and Marvin. 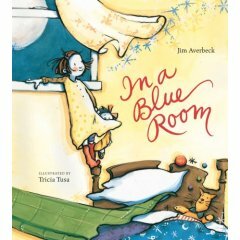 My most recent book is In a Blue Room by Jim Averbeck. What a pleasure it was finding that FedEx package on my doorstep one night. I was carrying in the groceries and tripped over it. I brought the envelope inside, sat on the couch, and as I read, I knew immediately what a pleasure it would be to illustrate. Pictures came to mind so quickly…all the way to its finish, where I saw the reader being taken out of the room way out into the universe. What an honor and delight it is to receive such a gift by surprise. In addition, what a delight it was to work with an editor the likes of Samantha McFerrin. Okay, the table’s set, and we’re ready to sit down and talk more specifics over coffee—and some Red Mate tea, of course—with Tricia (more like Six Questions Over Breakfast, since she opted out of the last one) — and Pivot her, of course. Tricia: My process varies from book to book — according to whatever I sense or see in my mind after reading the words. I draw sketches quickly so as not to deliberate too much and get in my own way. I will trace from these sketches directly, using a light box…all the while trying to maintain the spontaneous feel of these originals. Usually I will do thumbnails before any sketches in order to lay out the whole book…to see if it works as a whole. And, because the art in the dummy is very “finished,” the final art really flows and is fun to do. 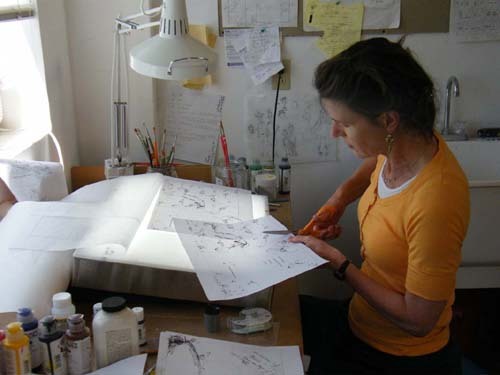 Tricia: My work studio is my refuge. I walk into that room and feel as though I have walked into my brain. Very private and full of natural light. It is separate from my home (imperative!). In fact, it is thirty miles from home near my daughter’s school. Whereas, I paint my own paintings and I sculpt clay pieces and sew things at my kitchen table. 4. 7-Imp: If you could have three (living) illustrators or author/illustrators — whom you have not yet met — over for coffee or a glass of rich, red wine, whom would you choose? 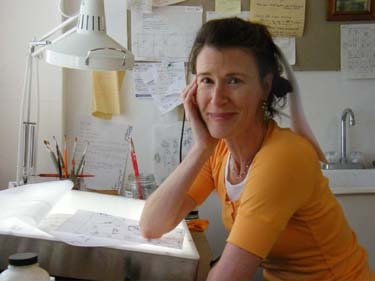 Tricia: I would have liked to have spent a day looking over William Steig’s shoulder as he worked…and then spent the evening with his wife and him over dinner. Tricia: My radio is tuned to NPR, and my CD player has Loudon Wainwright in it and David Sedaris stories. Tricia: Here goes. I wear gigantic, white, all-cotton underwear that can be pulled up under my chin if need be! Another cocooning effect. Tricia: Long talks with my husband…and watching my daughter be in the world…watching children, in general…and watching and listening to genuinely nice parents being with their kids. Tricia: Mean, stupid parenting…and small-minded, condescending politicians. Tricia: All of them are…perfect. Tricia: That owl that perches on top of our chimney and hoots down its hollowness. We hoot right back at him and he answers. I love the sound of my husband’s voice. I love the sound of my daughter laughing (at my jokes!!). I love the sound of those trains in the distance. And I love the sound of the wind through the pines on our land. Tricia: Acting in film and theatre! Running an orphanage. Being a really fine child psychologist — truly reaching them. Tricia: Any involving a boss and flourescent lights up above. Tricia: I in no way believe I will be greeted by God at some pearly gates. I feel heaven is right here, right where I am, right now…as well as deep inside of me. This is why I love my work, because it is so much fun to work from that place way down deep…to bring it up and out, look at it, and try to put it on the paper in front of me. 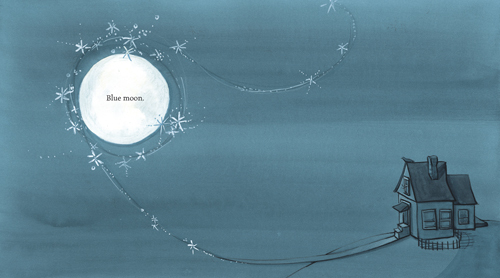 Spreads from IN A BLUE ROOM by Jim Averbeck, illustration © 2008 by Tricia Tusa, posted by permission of Houghton Mifflin Harcourt. All rights reserved. What a beautiful interview and what beautiful illustrations!! Cool interview. Need to get me a new cocoon! Oh thanks, Kelly. I still haven’t read my blogs today, so I just went and looked and saw Sara’s post. I’m with Sara and Tricia. Well, I’m not a writer, but if I needed to brainstorm, I can’t imagine a better idea than to wrap myself up in a cocoon of a blanket like that. Or just to de-stress even. Block out the world. Perfect. Maybe I should start doing it during my rare, child-free, quiet times. I particularly love the blue moon illustration. Beautiful, beautiful. 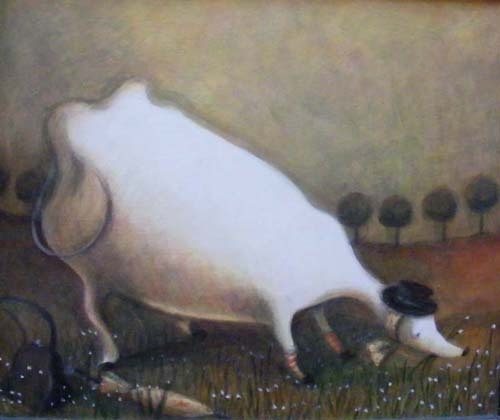 I love her PAINTINGS – such a different effect from her illustrations, but still recognizable in their whimsy. Also, I have long noticed that a lot of illustrators tend to resemble their illustrations in little ways. Doesn’t that picture of Tricia’s brown-shod feet sticking out from under the quilt look like something she’d draw? Another great interview, J. Thanks for sharing, Tricia. I love all of the behind-the-scenes photos and honest answers! 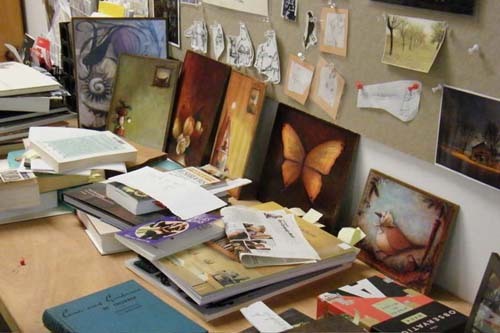 The butterfly illustration on the desk immediately caught my eye. 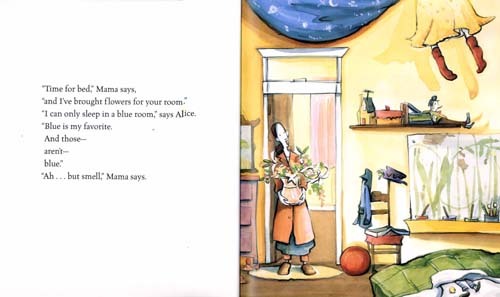 Lovely work in In a Blue Room, which I recently read at the recommendation of the 7-Imp ladies. Kudos for your dream occupations. I love the idea of the cocoon. And hooting back at the owl. Very cool…my family would be doing the exact same thing. Oh, how I enjoy these interviews. Thank you so much for this one. I LOVE the minutiae of it all. This is great. 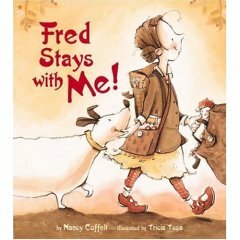 We had a future Newbery winner yesterday and a future Caldecott winner today. How do you manage it all? Thanks for this wonderful interview with Tricia Tusa. She sounds like the kind of individual I’d like to meet in person. I think we might connect. 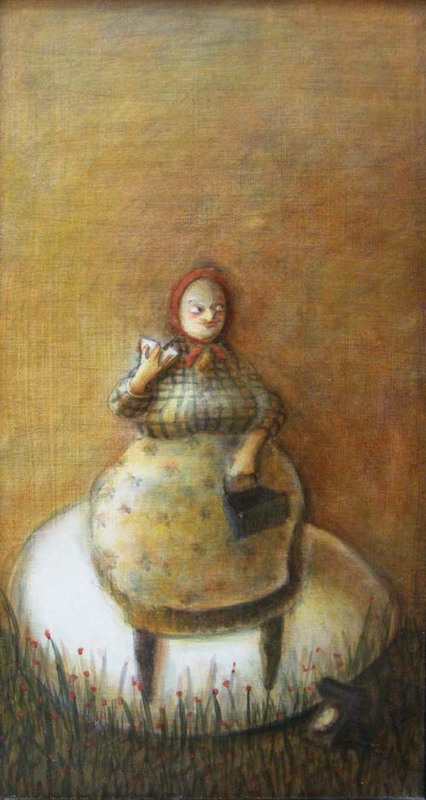 I had an only daughter in my mid-thirties, my radio is always tuned to NPR…and I love the work of G. Brian Karas! William Steig’s picture books were favorite read-alouds in my classroom, too. Gee…I hope I bump into her when I’m out in New Mexico later this month. I think IN A BLUE ROOM is such a special book. Tricia’s illustrations really add a wonderful dimension to Averbeck’s text. I especially like the way she did the ending illustrations in tones of blue. 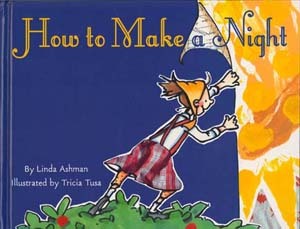 Her art for HOW TO MAKE A NIGHT is really different and quite dazzling–and enhanced the rhyming text by Linda Ashman–one of my favorite authors of books in verse. I hadn’t taken note of the fact that Tricia illustrated WING NUTS:SCREWY HAIKU by Paul Janeczko and J. Patrick Lewis before. I’m going to give that book a closer look today! Thanks again, Jules. I hope Tricia gets lots of attention for her newest book, IN A BLUE ROOM. It’s a winner!!! Carter, WORD! Wouldn’t those two books be good choices? I’m with you on those. Thanks to everyone else for reading and commenting. Yes, Elaine, I think you and Tricia are kindred spirits. Oh and, yes, Eisha, even Tricia’s shoes in her cocoon look like something she’d illustrate. I really look forward to her forthcoming books. What a treat to read this interview with Tricia. 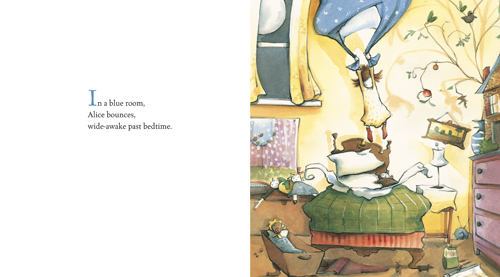 I love her work, and was thrilled when Harper asked her to illustrate HOW TO MAKE A NIGHT. This is one of the rare cases in which I had no contact with my illustrator, so it was really interesting to read Tricia’s comment about the cover. I am very fond of this book, and was sad that it had such a short shelf-life (quite literally). I share Tricia and Elaine’s appreciation for NPR (though only while in the car), William and Jeanne Steig (ALPHA BETA CHOWDER changed the way I write poetry), Lisbeth Zwerger and David Small. And only children, though mine is a boy. Thanks for a terrific interview–and for the peek into Tricia’s studio and at her gorgeous paintings, as well! I read in comments about the Illustrator, in the How to Make a Night that you live with your architect husband and two kids in a metal tree house in Houston, Tx, but in this article it says you live in New Mexico. If Tx, I would love to see the tree house. If you remember a little girl you baby sat for, and taught at Corlears School, she all grown up and she became an artist just like you! Caitlin just graduated from NYU with an MFA in Costume Design. Her design illustrations are amazing! She’d love to hear from you. She wrote to you c/o your latest publisher, but to no avail. You can check out her work at the web site above: cait-oconnor.com. I will be reading your book, “The Magic Hat” during Story Time at our local library next month. Just wanted to let you know that I think it’s a wonderful book and I’m excited about my Hat theme. I will also read, The Hat by Tomi Ungerer. Thanks for sharing your creative talent with the world! Hi, Tricia. I was Theo’s 2nd and 3rd grade teacher. I was looking for backgorund information about you for a librarian and found this wonderful blog. Life in New Mexico sounds heavenly. I know this is an unconventional way to try to contact an author. My name is Richard Vargas, events coordinator for Alamosa Books, Albuquerque. We are the only store in the region specializing in children’s literature. I would love to sent Ms. Tusa an email with more info about our store and ask that she consider letting us host an event highlighting her work. If there is anyway to forward this to her, it would be much appreciated. Hi are you the same Patricia Tusa who wrote the book ( The heritage mosques of Cochin )?